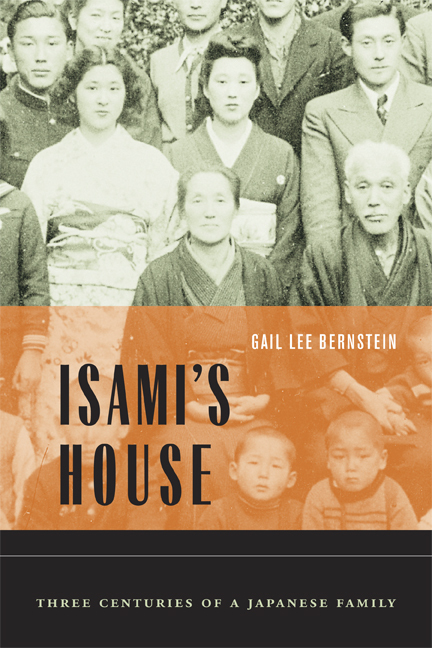 In this powerful and evocative narrative, Gail Lee Bernstein vividly re-creates the past three centuries of Japanese history by following the fortunes of a prominent Japanese family over fourteen generations. The first of its kind in English, this book focuses on Isami, the eleventh generation patriarch and hereditary village head. Weaving back and forth between Isami's time in the first half of the twentieth century and his ancestors' lives in the Tokugawa and Meiji eras, Bernstein uses family history to convey a broad panoply of social life in Japan since the late 1600s. As the story unfolds, she provides remarkable details and absorbing anecdotes about food, famines, peasant uprisings, agrarian values, marriage customs, child-rearing practices, divorces, and social networks. Isami's House describes the role of rural elites, the architecture of Japanese homes, the grooming of children for middle-class life in Tokyo, the experiences of the Japanese in Japan's wartime empire and on the homefront, the aftermath of the country's defeat, and, finally, the efforts of family members to rebuild their lives after the Occupation. The author's forty-year friendship with members of the family lends a unique intimacy to her portrayal of their history. Readers come away with an inside view of Japanese family life, a vivid picture of early modern and modern times, and a profound understanding of how villagers were transformed into urbanites and what was gained, and lost, in the process. Gail Lee Bernstein is Professor of History at the University of Arizona. She is the author of Haruko's World: A Japanese Farm Woman and Her Community (1996), editor of Recreating Japanese Women (California, 1991), and coeditor of Public Spheres, Private Lives (2005) and Japan and the World: Essays on Japanese History and Politics (1988).